So a new adventure for JHeart Photography is shooting film. I am learning SO much about all aspect of photography. I am so glad I got to practice with Sheena & Josh. They had such a gorgeous detailed wedding day that it was a joy to capture on film. Here are a few of my favorites. I have embarked on a new adventure to add to my business...shooting film. Yes, real load your camera 35mm film. So I went online, bought a Nikon F100, scooped up some cheap FUJI film from Wal-Mart to mess with at a lower expense because let's face it....I figured it wasn't going to really turn out. As well as ordered from Amazon 5 rolls Kodak Porta 400 from online for the good shots while in Portland. I got it in the mail. I loaded the film. I loaded the batteries. I snapped they shutter. I simply just fell in love....one snap after the other. I really think the best part was not knowing if they turned out! I had to trust my skills and the film. It was so beyond my normal adventurous stuff! It's not easy...here is my first shot...my beautiful Gabrielle. Horrible right??? HA! But take a peek in to what I see....See that grain? That beautiful old school grain. It took me back to when I used to arrange my stuffed animals in my room with random objects and take their pictures with my old point at shoot 35mm....I am sure if I looked hard enough at my Mother's house I could find some of these pictures. This look and image...well it fuels my soul. Oh it fuels my soul, more than I ever thought possible. So next up I headed out to Portland...remember that blog post? If not view it HERE. You really should because it's beautiful. That post was all digital images that I just couldn't wait to share. But below is what film can do...what it does...oh it's beautiful...the grain, the color, barely touched by editing. Are they perfect? Nope. But they are a wonderful and perfect start to something will be so much fun. I am beyond grateful that a good friend (and my wedding photographer) shoots film and brought it to me to try because she knew I would love it, and boy was she correct. You can take a peek at her beautiful work HERE. She has really become amazing at her film work! Take a peek at this beautiful film shot of my friend and follow photographer. While shooting in Portland I found out I even LOVE the sound of shooting film. 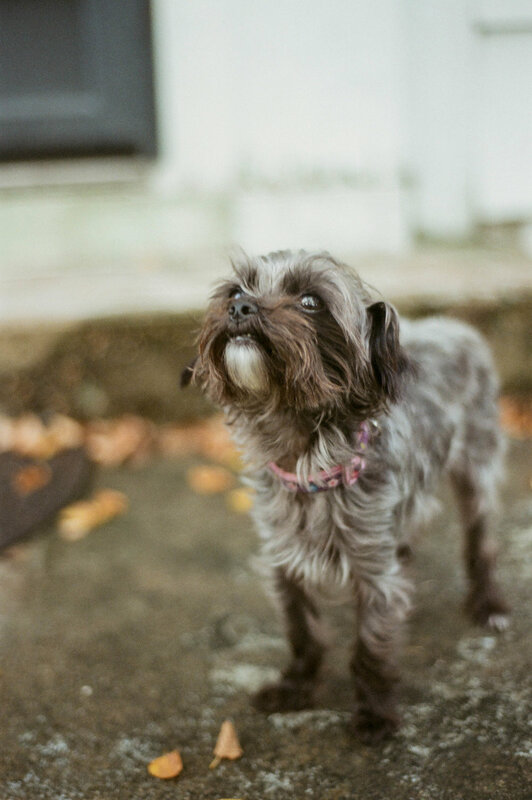 When I came home I naturally shot a whole roll of just my dog Rue...ridiculous I know, but oh it turned out so much better than the first roll! These are just a few of my favorites. Rue is a pretty amazing model. I know you all have seen her before! I do hope you stick around to see how this new aspect of Jheart Photography grows. I feel like this fits my heart and soul so much which usually is the main key to success. So cheers to film & my Nikon F100. Can't wait to share more with you!